For MSD, it was a bittersweet return to their home turf without longtime assistant coach Aaron Feis. 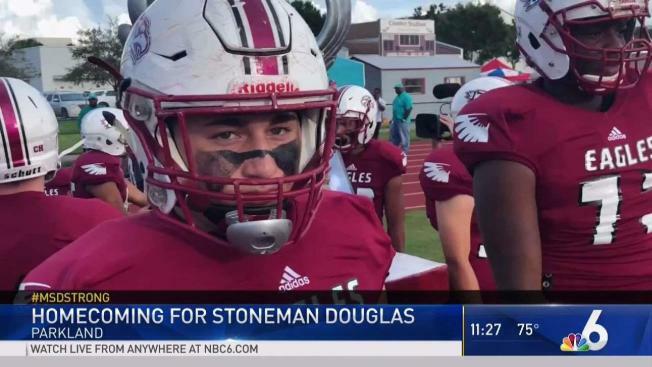 In their first home game since the mass shooting in February, the Marjory Stoneman Douglas High School football team won by 17 points in a game dedicated to the 17 people - including one of their own coaches - who lost their lives in the tragedy. The Eagles won 23-6 over the South Broward High School Bulldogs Friday night in the first of five games at home over the course of the 2018 regular season. In a bittersweet return to their home turf without assistant coach Aaron Feis, each player donned the number 17 on their helmets. The number was painted on the field. A framed photograph of Feis and a No. 17 jersey was displayed below a proud eagle statue. And a banner with the words "Fearless, Emotion, Intensity, Sacrifice" was displayed in an acrostic next to a photo of Feis, a tribute to the assistant coach. Feis, who graduated from the program and worked with the team while also serving as a security guard at the school, was hailed a hero after shielding several students from the gunfire during the Feb. 14 tragedy. 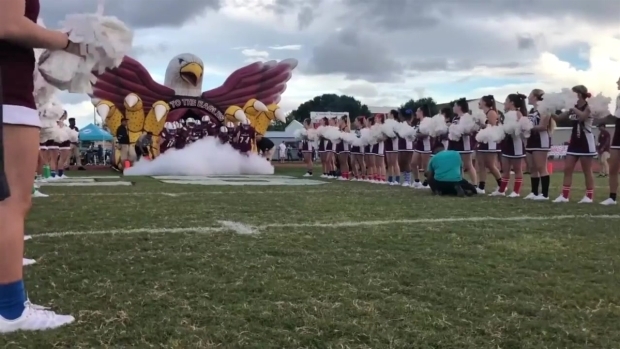 In their first home game since the mass shooting in February, the Marjory Stoneman Douglas High School football team won by 17 points in a game dedicated to the 17 people killed in the tragedy.